The Hampstead Road was an ancient thoroughfare. In the 1830s it led out of London through the Duke of Bedford's and Lord Southampton’s estates. With the arrival of the Regent’s Canal at Hampstead Road in 1816, businesses were established in Camden alongside the Hampstead Road, based on the wharves and basins immediately above and below Hampstead Road Lock. 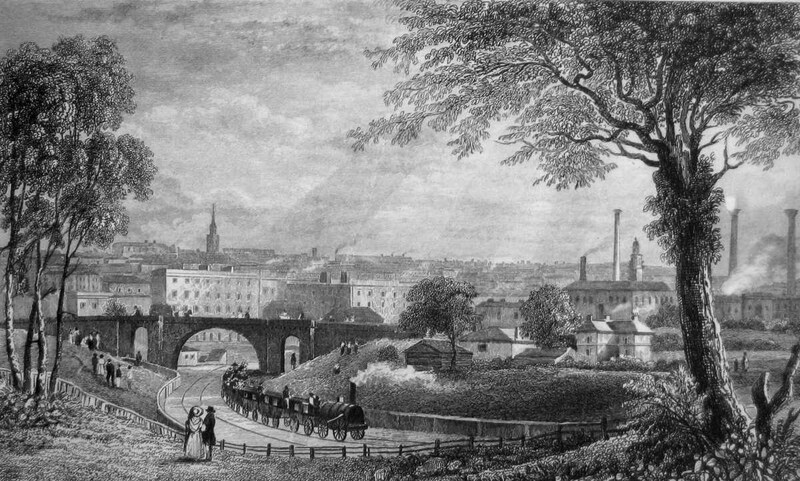 The London & Birmingham Railway started operating from Euston for passenger traffic in 1837. Camden Goods Depot was established in 1839 on 30 acres of Lord Southampton’s land as the terminus for goods trains, in anticipation of further extension of the railway to London’s docks. The influence of Lord Southampton and others required that rope haulage on Camden Incline was used to draw passenger trains from the Euston terminus to meet their waiting locomotives at Camden for the onward journey. Stationary winding engines housed in vaults under the main line, with impressive twin chimneys, were built for this purpose. From Camden passengers continued their journey by locomotive under Chalk Farm Lane Bridge and through Primrose Hill Tunnel. The location of Camden Goods Depot alongside the Regent’s Canal and the Hampstead Road stimulated its commercial and industrial development. Pickfords, as the largest agents for the railway company, were the first to respond to this opportunity. Pickfords goods interchange shed was established on the south bank of the Regent’s Canal in 1841, soon to be followed by LNWR goods interchange facilities. The Camden Goods Depot from its inception had to provide stabling for the many horses that worked in the depot or in the carriage of goods to and from the depot. The Victorian working horse was a vital factor in Goods Depot operations and many of the facilities in the depot directly reflected the need to accommodate, feed and ensure the health and safety of horses. Vaults under the railway were used for storage. One of the most important businesses attracted to the Goods Depot was the wine, beer and spirits trade. Gilbeys, the largest firm in the world in the wine and spirits trade in the last quarter of the 19th century, established a distillery, bonded storage, bottling plants, and a range of associated industries in the premises they owned and leased in Camden. The beer trade served the needs of the capital from beer stores in the goods yard, stocked by rail transport from the Midlands and elsewhere. At the same time the growing local community, including thirsty railway workers, were served by a burgeoning number of public houses. Piano manufacture gravitated to Camden, benefitting from its ties to the West End showrooms and from the strategic location of Camden for transport of the finished product. See also pages on locations. If you have any additional information about the social and economic history of the area, then we would be pleased to hear from you. Please contact the secretary.